Artist impression of the Osborne South Naval Shipbuilding Precinct. Image via Commonwealth of Australia, Department of Defence. 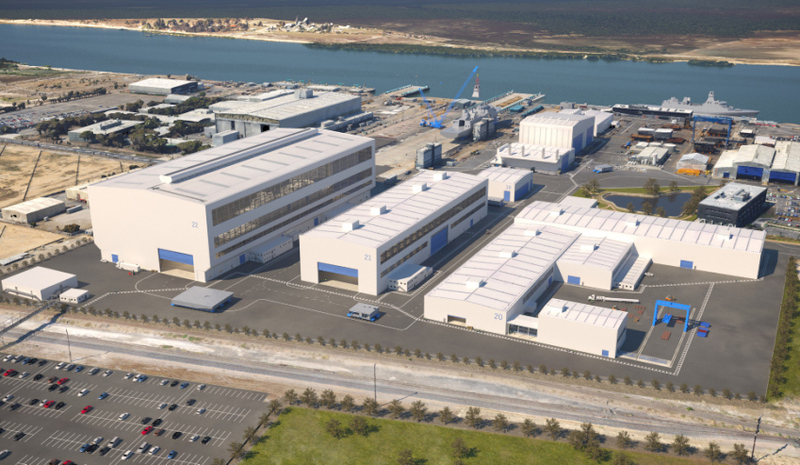 Australia’s latest investment in naval shipbuilding infrastructure is officially taking shape, with the government unveiling its design for the $535 million Osborne South Precinct. Minister for Defence Industry Christopher Pyne turned the first sod of dirt at the site of the Osborne South naval shipyard where the Future Frigates will be built. The minister said the unveiling of the design for this $535 million project is an exciting insight into the future of Osborne’s shipyards, which is a result of the government’s $89 billion investment in Australia's future shipbuilding industry. The government has also finalised the purchase of the initial tranche of state-owned land and facilities, and has also received state planning consent for construction of the new shipbuilding infrastructure. The facility at Osborne in Adelaide was purchased from the SA government for $230 million in May this year. The federal government will now fully own and operate the facility and will play an important part in getting the infrastructure up and ready to cut steel on the Offshore Patrol Vessels next year. Jim Whalley, appointed as a director, is a co-founder of Nova, a firm specialising in the provision of engineering and management services and a former air force pilot. The ANI board is now undertaking a commercial process to select the shipyard builder, with a decision to be announced in the coming months.